Happy Nutella Day! February 5th is officially World Nutella Day. It started out in 2007 with a couple huge fans of Nutella. It has caught on and now people all over the world can have another excuse to consume Nutella. (not like you really need an excuse) You can find 100's of recipes with Nutella here on the Nutella Day website. Thankfully my son (who is allergic to peanuts) has actually been cleared to eat Nutella and we love it in our home. I recently bought a Nutella cookbook and thought I'd give cooking with it a try. I was making sweet rolls for my family on a cold winter day, and I thought about adding Nutella to the middle. My boys love spreading Nutella on the top of the sweet rolls, so why not put it in the middle as well?! I use my mother-in-law's recipe because my husband is a sweet roll connoisseur and he knows when I've been experimenting with other recipes. He always says, "This is good, but it's not my mom's." So I now always turn to this recipe for sweet rolls. IF using a bread machine to make your dough, then add all the liquid ingredients first. (or according to the directions of your machine). I heat the 1/2 c milk and the 1/4 c butter together until the butter is mostly melted. Add to machine. Add warm water. (How warm? It depends in how warm your butter/milk combination got. You may need to cool it off by adding not so warm water. Then add the 2 beaten eggs. Then add all the dry ingredients. Choose 'dough' cycle and turn on machine. IF doing it by hand, then place your warm water in a large bowl along with the yeast and teaspoon of sugar to proof. Wait 5-10 minutes. Meanwhile, in a small saucepan (or in the microwave) mix together the milk, remaining sugar, salt, and butter and heat till butter is mostly melted. Then cool to lukewarm. Add the beaten eggs to the milk mixture. Add the milk mixture to the yeast mixture. Mix in the 4 1/2 c flour and then turn out on counter and knead until you have a smooth and nonsticky dough. Place in a lightly greased bowl, cover, and let rise for about 1 1/2 hours. When risen to twice its size, (or when the dough cycle on the machine is finished) punch the dough down in the middle and let rest a few minutes. Divide dough into two balls. This recipe usually makes 2 9x13 pans of sweet rolls. Prepare your baking pans by greasing them with either butter or non stick spray. Roll one ball out to a 13 x 9 (approximate) rectangle. Spread with half of the softened butter. (the other half is for the other ball of dough). Sprinkle 1/2 c brown sugar to form a thin layer all over. The butter and the brown sugar is what it going to form the caramel goo that is so classic with a sweet roll. 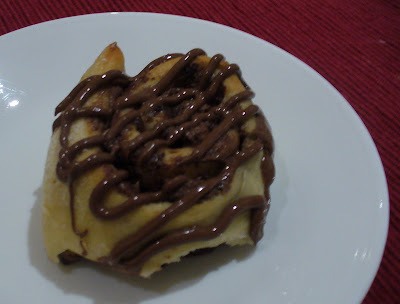 (although we're using Nutella as well, I just have to have that caramely goo on the bottom of my sweetroll!). Sprinkle with cinnamon (more or less for taste). Skip the cinnamon if you want to have more chocolate flavor and replace it with cocoa powder. (about 1-2 Tbsp for the whole rectangle. Attention: this will make it extra chocolaty! Heat Nutella so that it's easier to drizzle, (about 30 sec-1 minute in microwave) and drizzle 1/2 cup all over the sugar. Try not to drizzle over the bottom inch of your rectangle or else it will squish out as you roll it up. Roll it up jelly roll style. Repeat all the above steps with the second ball of dough. Preheat oven to 375 degrees. Cook sweet rolls in oven for 15-18 minutes or until the top is nicely golden, but the middle is still cooked. For the sugar glaze add powdered sugar in a small bowl and gradually add milk by mixing with a fork. Don't add all the milk at once, because you might need less. If your glaze gets too runny, just add more powdered sugar. If too thick, add a little milk. You want it to be a drizzle consistency. Drizzle over your warm sweet rolls. IF you don't like Nutella or don't want to make them chocolaty, then of course you can make these like regular sweet rolls. Add more cinnamon to taste or raisins. Here are some regular ones. It's a good thing this is not on my approved diet list, because I am pretty sure I could eat a whole pan. Yummalicious! I just bought all of the ingredients for this and plan on making them this week!